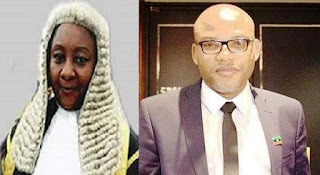 Justice Binta Nyako of an Abuja Federal High Court has threatened to withdraw from the ongoing trial of Nnamdi Kanu, leader of the Indigenous People of Biafra, IPOB. Speaking during today’s trial, the trial judge predicated her threat on what she described as attempts by the defense to frustrate her. Justice Nyako’s warning came, following series of arguments between herself and counsels to the IPOB leader.